Everybody loves park rangers. You know, those folks in the Smokey-the-Bear hats. Friendly, courteous, helpful. Now they are emerging as rogue force of resistance to Donald Trump. Scientists and people who love nature are not to be trifled with. According to a Washington Post story by Darryl Fears and Kayla Epstein, It started with tweets by a former Badlands National Park Service employee who wanted to re-educate Trump on climate change. The initial tweets by the Badlands employee were quickly taken down, but not before earning the hashtag, #Badasslands. Service. Come for rugged scenery, science facts & climate change information. Run by non-gov individuals.” In its first day, the site garnered nearly half a million followers. Other protest accounts soon sprouted according to a list called Twistance created by Alice Stollmeyer. Stollmeyer is a digital advocacy strategist and founder of the consultancy @StollmeyerEU. Her list includes accounts such as RogueEPA, AltMuirWoods, Rogue NOAA , Stuff EPA Would Say and lots more. The major impact is that people are taking note, and it’s raising red flags all over the place. One of the riskiest things would be for censorship, whether it’s of journalists or of scientific institutions, to go unnoticed. Censorship is a very slippery slope. It started at the inauguration, when the uniformed protectors of America’s front lawn took in the sweep of humanity at the National Mall. It seemed obvious that the crowd for President Trump was not nearly as large as that for Barack Obama in 2009. Somebody in olive green retweeted the obvious, using comparative pictures. This small act of historical clarification by the keepers of our sacred sites and shared spaces would have been no big deal, had not the response from the new president sounded like an edict from the Dear Leader. 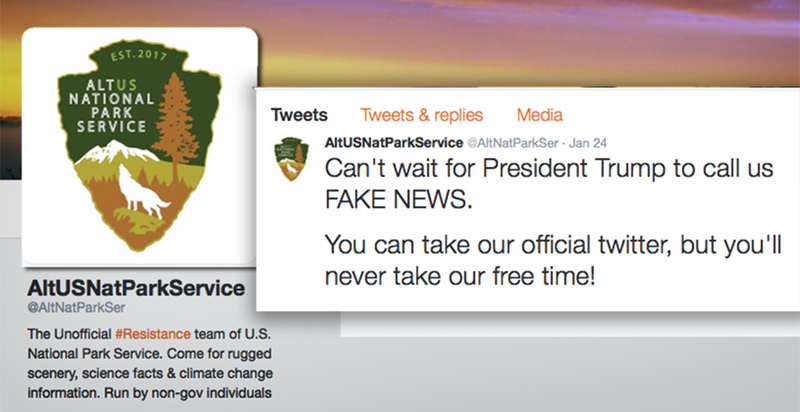 A gag order on public servants was issued, and the National Park Service tweet on crowd size vanished, replaced by a picture of a bison. But then, flares of defiance! The response to the dawning realization that a crazy man had taken over the White House was truth. Here’s a suggestion: Go rogue, you lovable park rangers and biologists; tell the truth about science, you nerds in funny hats and badges. Let Trump’s thought police come after you at Golden Gate for tweeting that “2016 was the hottest year on record for the third year in a row.” Oh, the audacity of science! Now the fight has begun. I always knew I could depend on those folks in the Smokey-the-Bear hats.